Every morning Uncle Tobias goes fishing. Sometimes he is joined by two little boys. Together they spend the day moving from one place to another - from the beach, to the bridge and the mangroves on the outskirts of the city - and back to the edge of the city. Along the way they meet other friends of Uncle Tobias - Auntie Ruby and Old Isaac - and listen to stories about Uncle Tobias' ancestors and other times. You and Me- Our place is about difference - old and new cultures that exist side by side - but more importantly it is about sameness. Leonie Norrington was born in Darwin and spent much of her childhood on a remote community, growing up among Aboriginal people who lived in the traditional way. Her first novel for children, The Barrumbi Kids, was an Honour Book in the 2003 CBCA Awards for Younger Fiction. It was followed by Spirit of Barrumbi, Leaving Barrumbi (shortlisted by the CBCA in 2008), and The Last Muster. 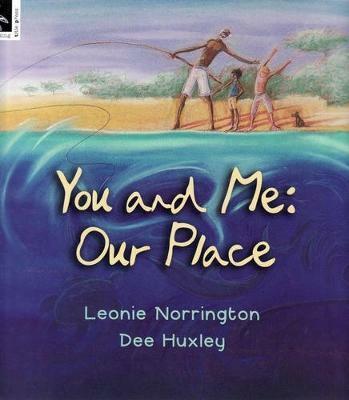 Leonie has written a picture book, You and Me- Our Place, which was also shortlisted by the CBCA in 2008. Her latest book is The Devil You Know.